Medical Aesthetics refers to the techniques used to enhance the appearance of individuals or also re-constructive procedures for patients who require reconstructive surgery owing to illnesses or accidents. Removal of scars, tigheting of skin, reduction of fat and breast enhancement are just a tip of the iceberg of what medical aesthetics actually entails. While a considerable amount of surgical aesthetic procedures are carried out across the globe, there is tremendous demand for non-surgical aesthetic procedures as well, which are mostly elective with the intention of improving one’s appearance and psychological well-being and social status. People in the age group of 30-60 years of age are turning to medical aesthetics to deal with and mask their ageing process. However, the side effects associated with such treatments can potentially hamper the growth of this market. There has also been an increase in cases where simple treatments have had severe consequences on the patients. While this can be attributed to ill equipped and uncertified practitioners performing such treatments, such cases can hinder the growth of the market when publicized. Increase in the disposable income levels in emerging economies is what is driving the market in regions such as Asia Pacific and South America. 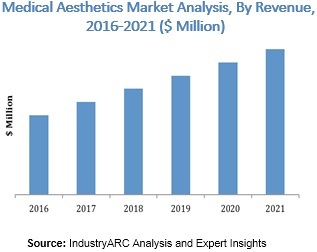 Apart from this, the presence of cheaper options in asia pacific have give rise to medical tourism and medical aesthetics is a major segment of that market. People from North America and Europe are flocking the market in asia owing the the stark differnce in prices in the region. North America and Europe currently account for the largest share of the market. With a large aeging population in Europe, the demand for medical aesthetics is quite high.